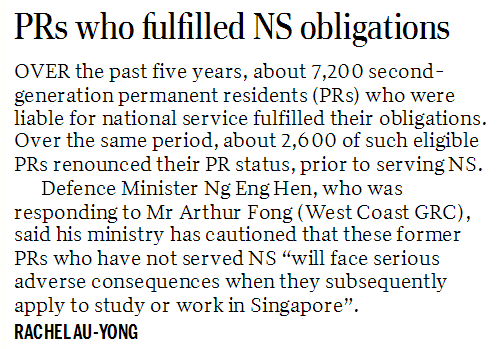 “Over the past five years, about 7,200 second-generation permanent residents (PRs) who were liable for national service fulfilled their obligations” (PRs Who Fulfilled NS Obligations, Miss Rachel Au-Yong). Some might be riled by the 2,600 National Service (NS)-liable permanent residents (PRs) who, over the past five years, renounced their status prior to serving NS (ST, June 8). Under the sponsorship of their parents, these second-generation PRs have used Singapore conveniently as a mere stepping stone to further their studies or careers elsewhere. The Ministry of Defence has always maintained that these former PRs will “face serious adverse consequences when they subsequently apply to study or work in Singapore”, but has stopped short of the specifics or details of how these ramifications have applied in the past. Yet over the same period, between 2009 and 2013, 7,200 second-generation PRs had enlisted for and fulfilled their NS obligations. When Defence Minister Dr. Ng Eng Hen answered a similar parliamentary question by Dr. Lim Wee Kiak in 2011 – for the period between 2006 and 2010 – 8,800 males served NS, and 4,200 males renounced their PR status prior to serving NS. In the 2012 “Singaporeans’ Attitudes to National Service” survey report, the researchers from the Institute of Policy Studies (IPS) revealed that about a third of the children of PRs and new citizens did not choose to serve NS after the age of 18. “Over the past five years, about 7,200 second-generation permanent residents (PRs) who were liable for national service fulfilled their obligations”. In this context, notwithstanding that NS-liable males might have renounced their PR status for other reasons, it is encouraging that proportionately fewer males have chosen to renounce. Especially with the sacrifices and effort required to complete the two years of conscription. Still, whether new citizens and first-generation PRs should do NS – or something equivalent – is another question altogether. Perhaps Mr. Arthur Fong should have tabled more specific questions, to ask how many new citizens and first-generation PRs are below the ages of 40 and 50, the cut-off dates for reservist obligations for enlisted men and officers respectively. Discussions and recommendations by the Committee to Strengthen NS (CSNS) did not focus on this concern, though the volunteer corps could gather a few sign-ups from this group. In that sense the success of the volunteer corps will be important. National surveys in the past – the REACH Policy Study Workgroup on integration issues in 2010, the aforementioned IPS report, and the first independent survey on Singaporeans’ attitudes towards NS commissioned by the CSNS last year – have reaffirmed the desire of Singaporeans for new citizens and first-generation PRs to serve as volunteers or in professional roles. However, the same IPS report found that while 69 per cent of Singaporeans felt that NS is an important indicator of integration in the country, only 43 per cent of new citizens thought so. So a half-full glass, but a lot more ahead of us.